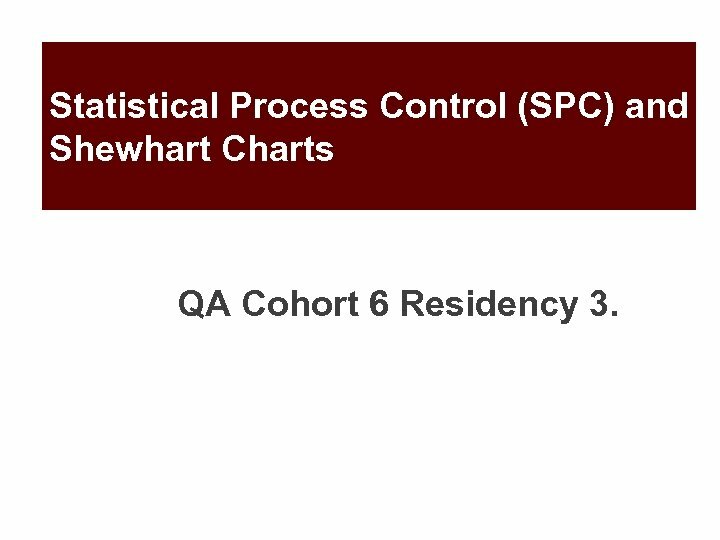 Statistical Process Control (SPC) and Shewhart Charts QA Cohort 6 Residency 3. 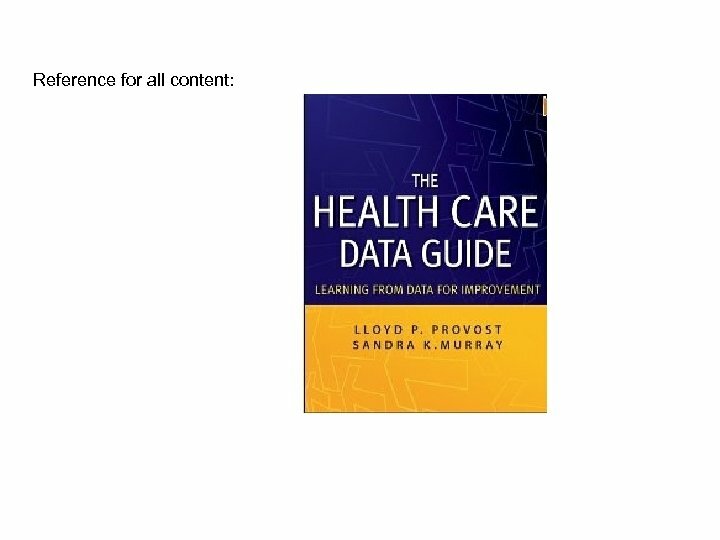 Methods for Improvement, Accountability and Research Improvement Accountability/Performance Measurement Clinical Research Purpose Improvement of care; application of evidence Comparison between organizations or to a Generate evidence or new criteria, reassurance, spur for change knowledge Data Collection Accept consistent bias in data collection Statistical adjustments to reduce bias Design of experiment to reduce bias Sample Size Small sequential samples of data 100% of available data Large samples so there is enough data for possible hypothesis Analysis Run Charts of Shewhart Charts NA Inferential statistics and hypothesis testing (assumes same : T-tests, F-tests, Regression Analysis, etc). 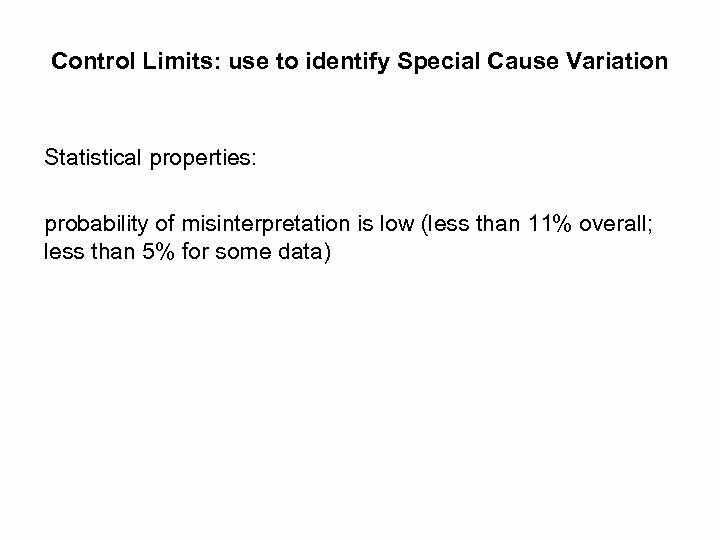 with p-value Adapted from: Solberg, L. I. , Mosser, G. , Mc. Donald, S. (1997). 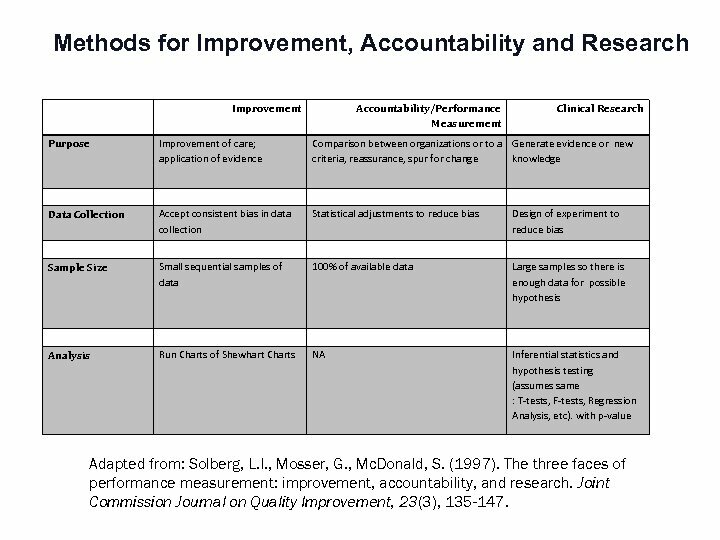 The three faces of performance measurement: improvement, accountability, and research. 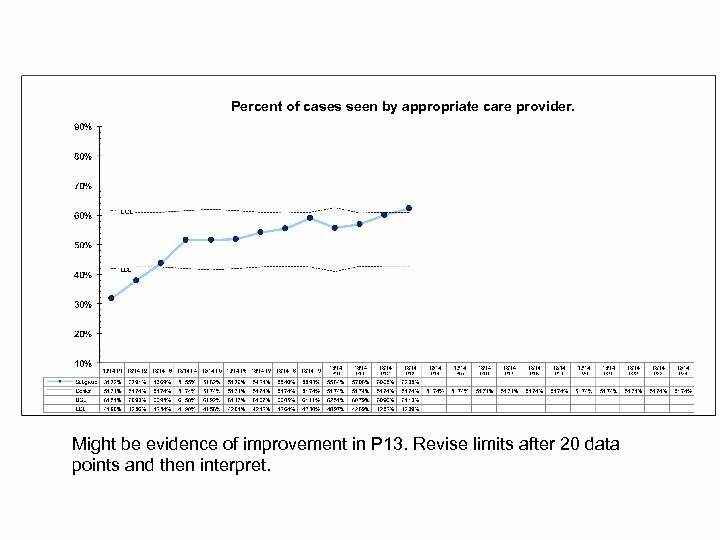 Joint Commission Journal on Quality Improvement, 23(3), 135 -147. 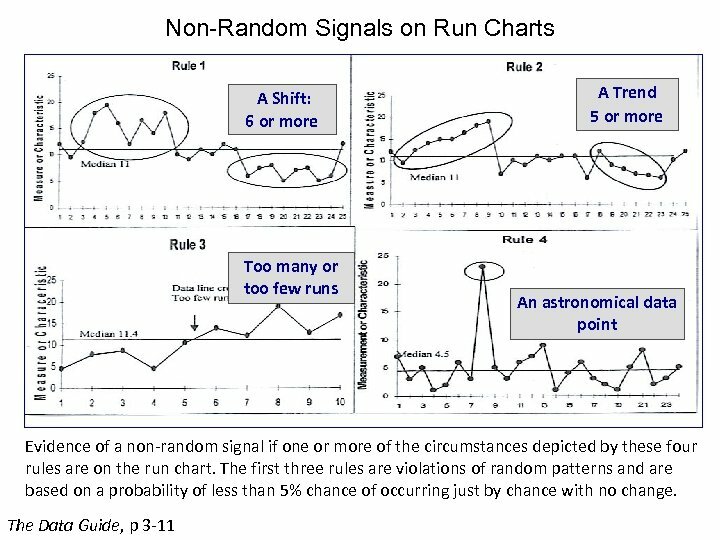 What do run charts tell us? 1. 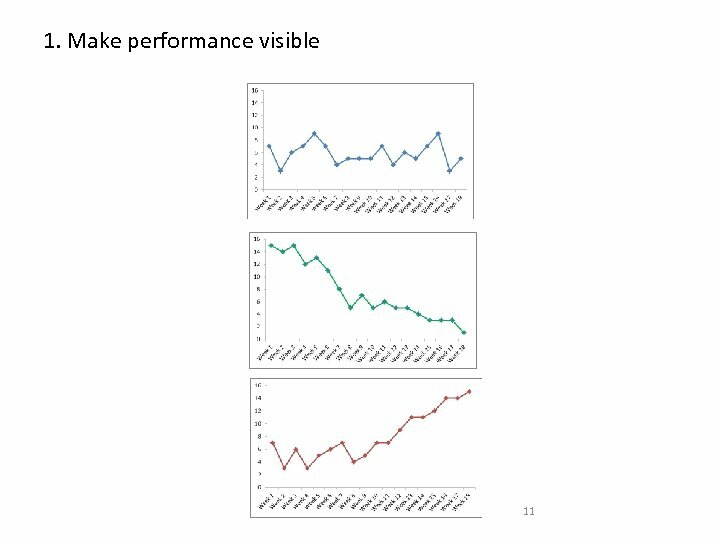 Make performance visible 2. 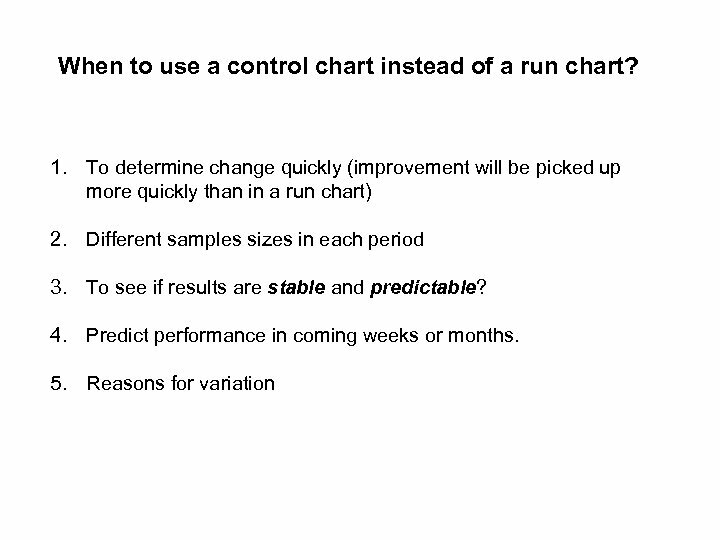 Is there improvement – probability based tests. 3. 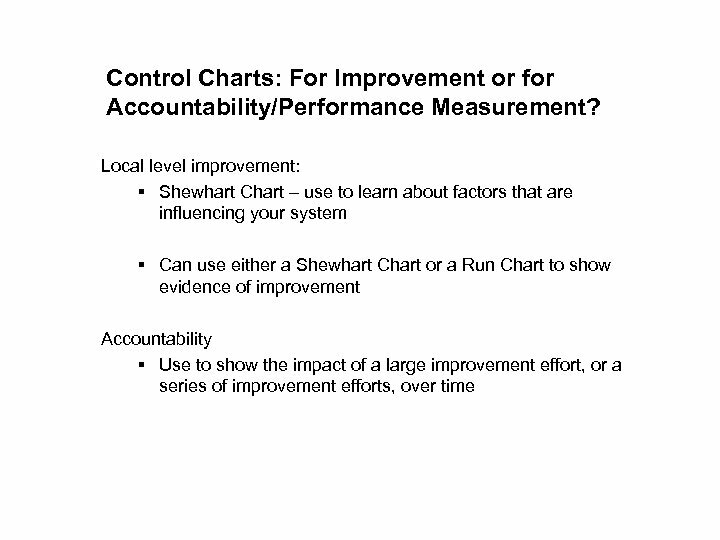 Is the improvement holding? 4. 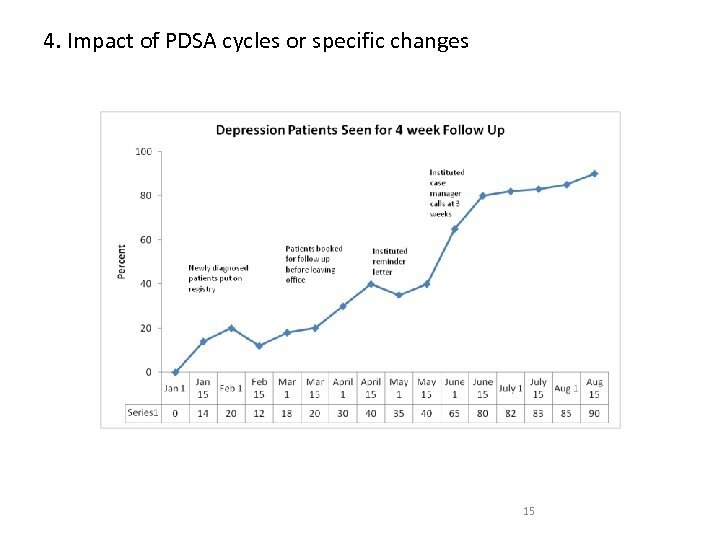 Gives a sense of impact of various PDSA cycles. 3. 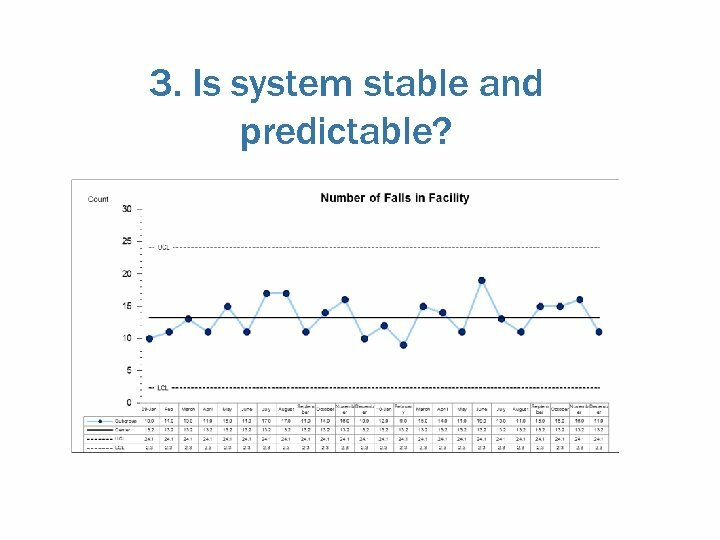 Is system stable and predictable? 4. What will result be next month? 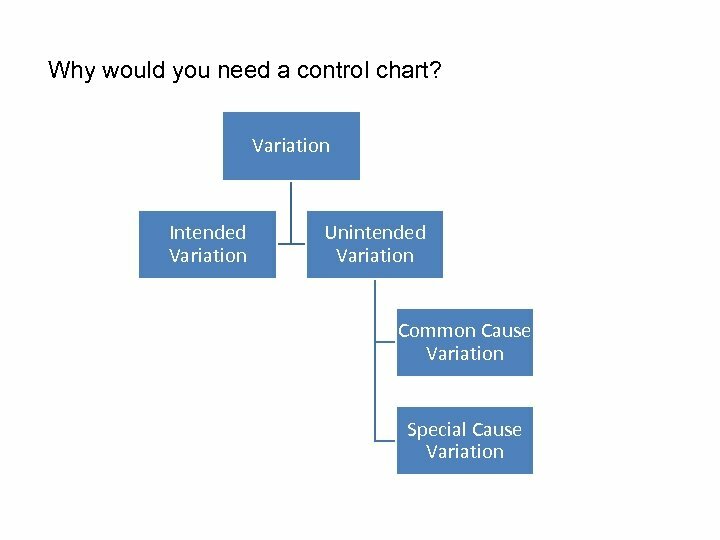 Is Special Cause Variation Good or Bad? 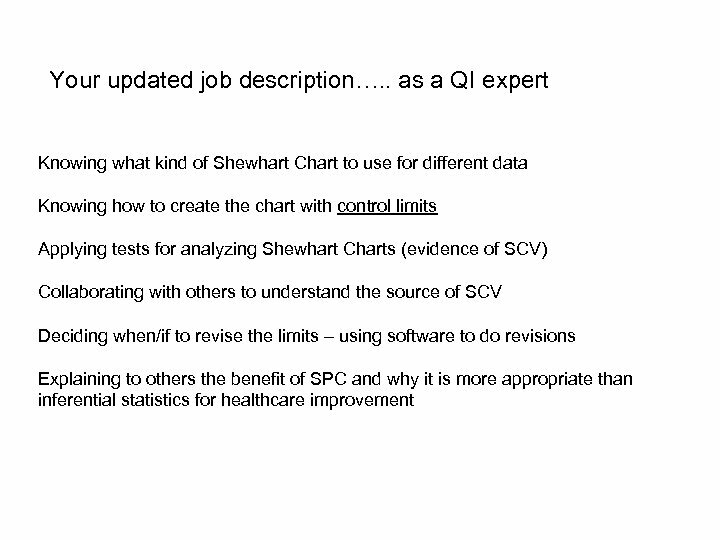 For improvement work: 1. 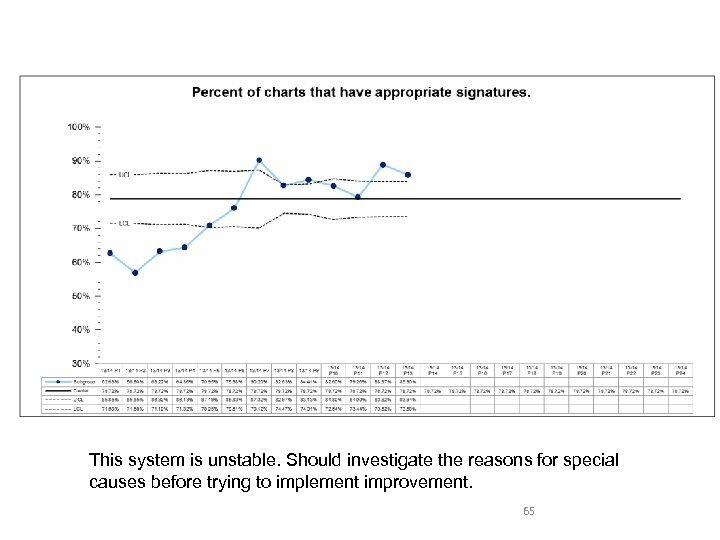 Bad: evidence of SCV in our existing system (baseline) means system is not stable. 2. 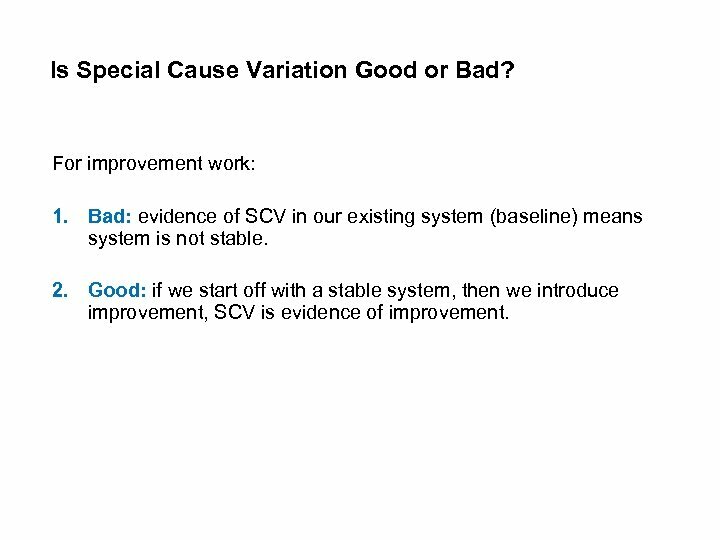 Good: if we start off with a stable system, then we introduce improvement, SCV is evidence of improvement. 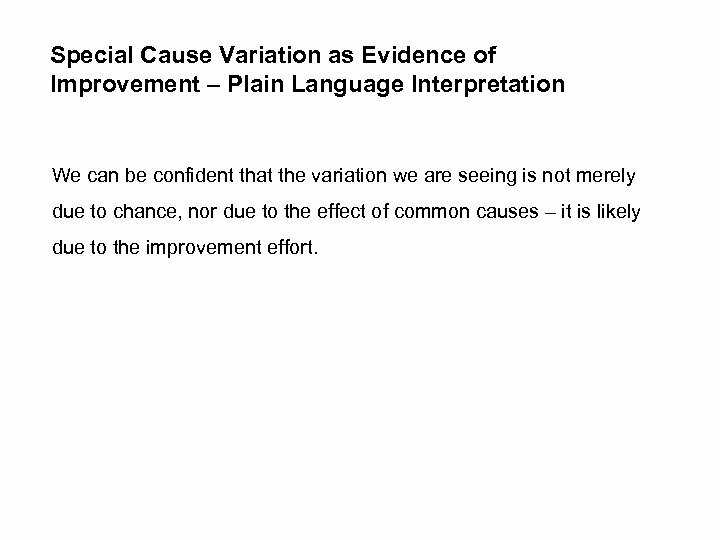 Special Cause Variation as Evidence of Improvement – Plain Language Interpretation We can be confident that the variation we are seeing is not merely due to chance, nor due to the effect of common causes – it is likely due to the improvement effort. Reflection 1. 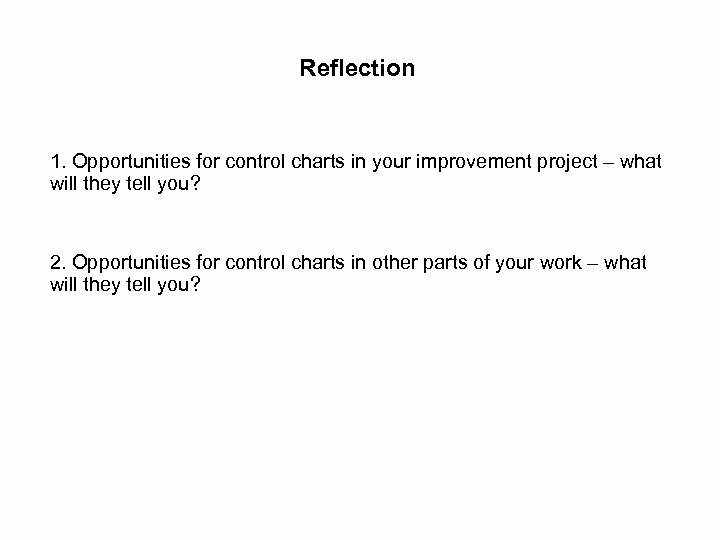 Opportunities for control charts in your improvement project – what will they tell you? 2. 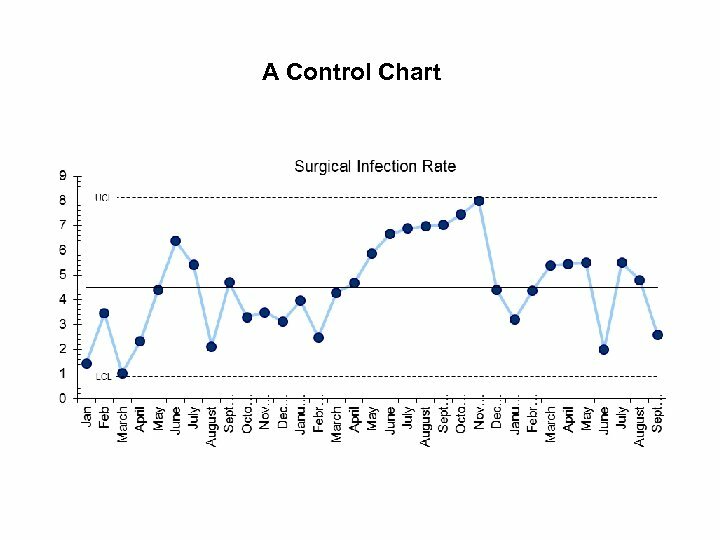 Opportunities for control charts in other parts of your work – what will they tell you? 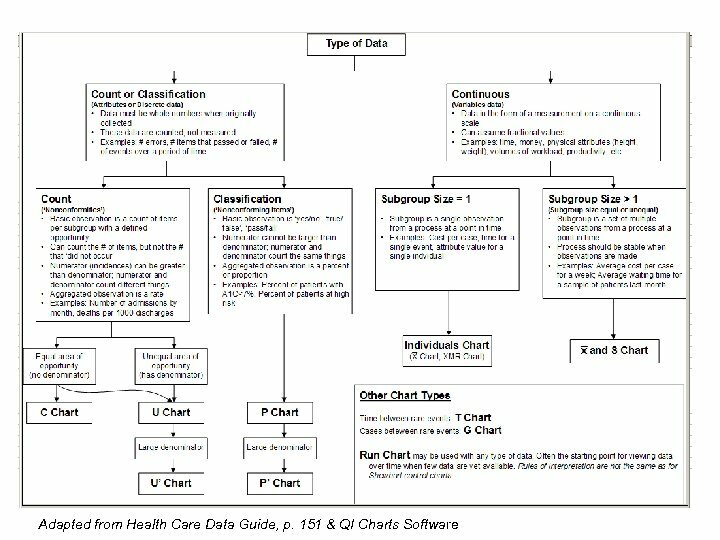 Commonly Used Type of Data Type of Chart Example Specs Percent data P chart Percent of patients who received the flu shot. 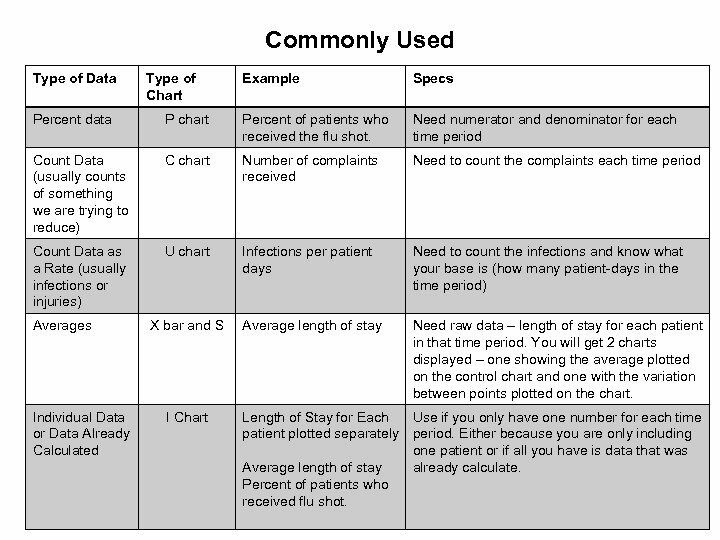 Need numerator and denominator for each time period Count Data (usually counts of something we are trying to reduce) C chart Number of complaints received Need to count the complaints each time period Count Data as a Rate (usually infections or injuries) U chart Infections per patient days Need to count the infections and know what your base is (how many patient-days in the time period) Average length of stay Need raw data – length of stay for each patient in that time period. 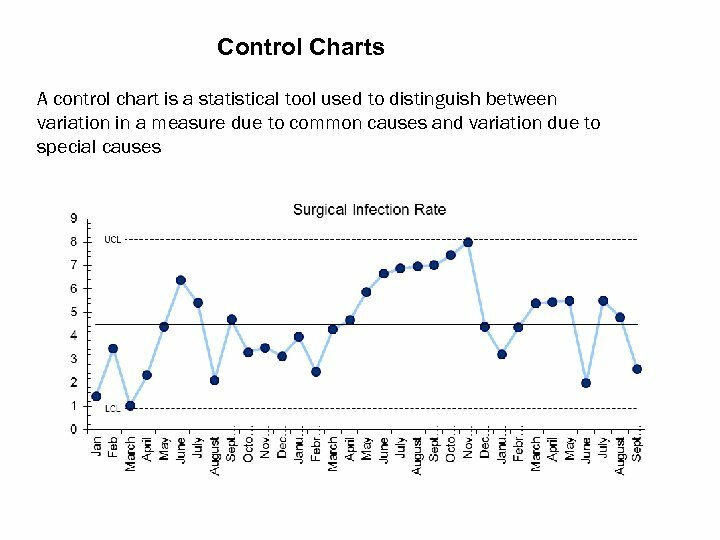 You will get 2 charts displayed – one showing the average plotted on the control chart and one with the variation between points plotted on the chart. Averages Individual Data or Data Already Calculated X bar and S I Chart Length of Stay for Each Use if you only have one number for each time patient plotted separately period. 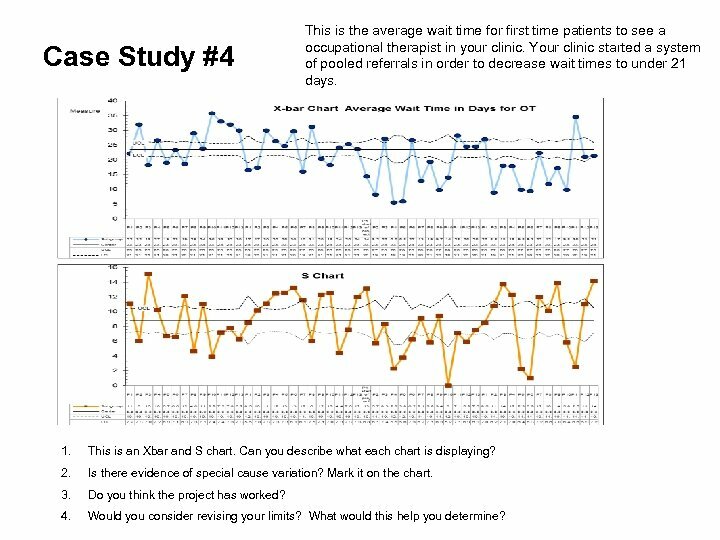 Either because you are only including one patient or if all you have is data that was Average length of stay already calculate. 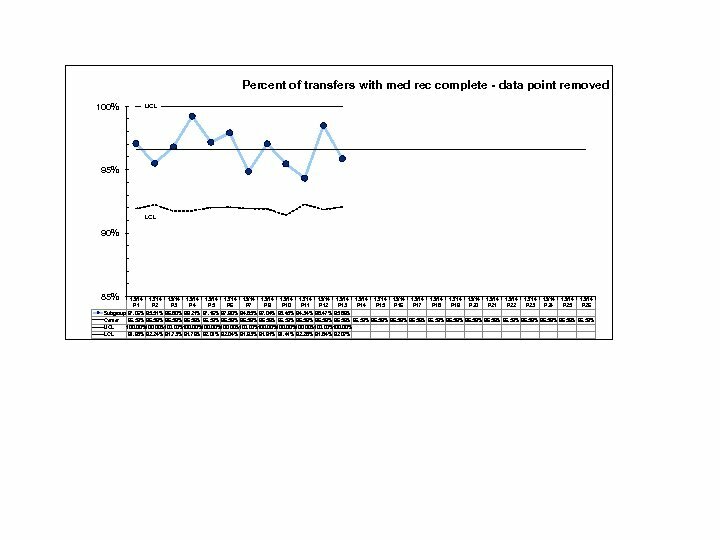 Percent of patients who received flu shot. 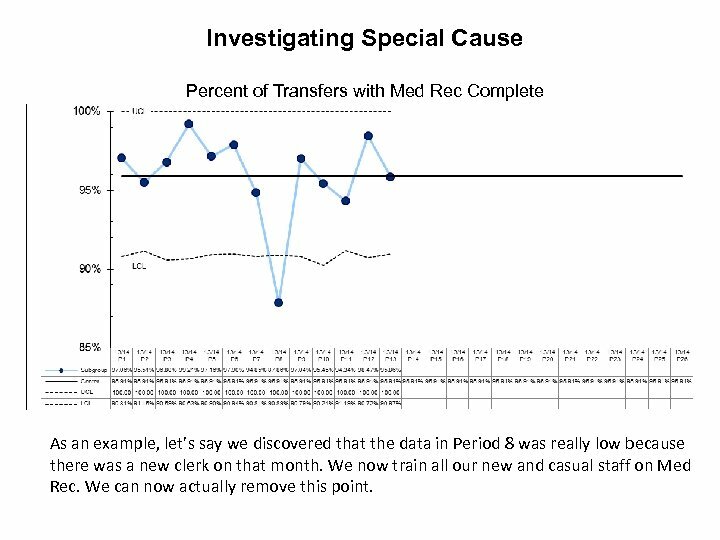 Investigating Special Cause Percent of Transfers with Med Rec Complete As an example, let’s say we discovered that the data in Period 8 was really low because there was a new clerk on that month. We now train all our new and casual staff on Med Rec. We can now actually remove this point. 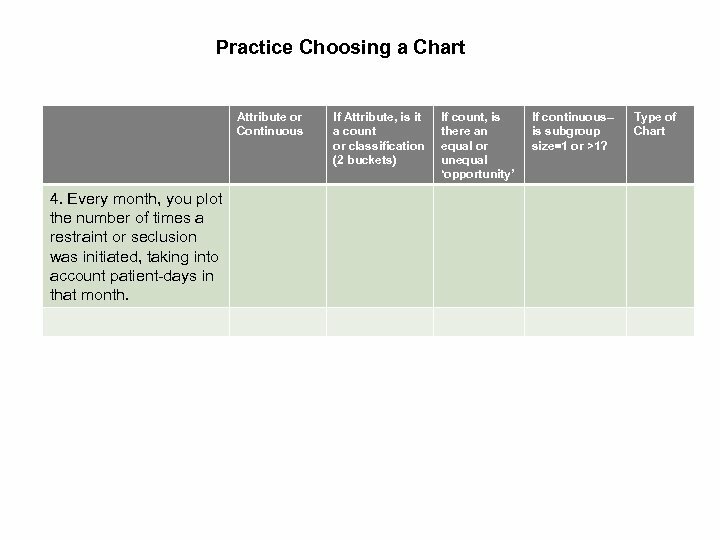 Percent of cases seen by appropriate care provider. 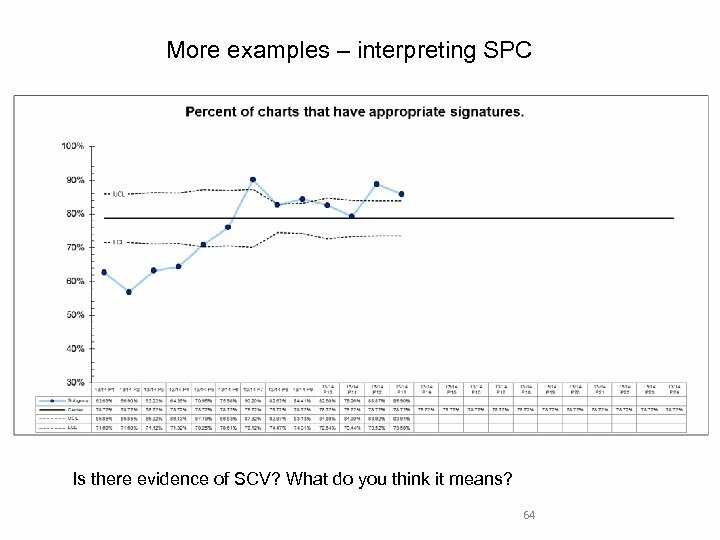 Is there SCV in this baseline data? What is the interpretation? 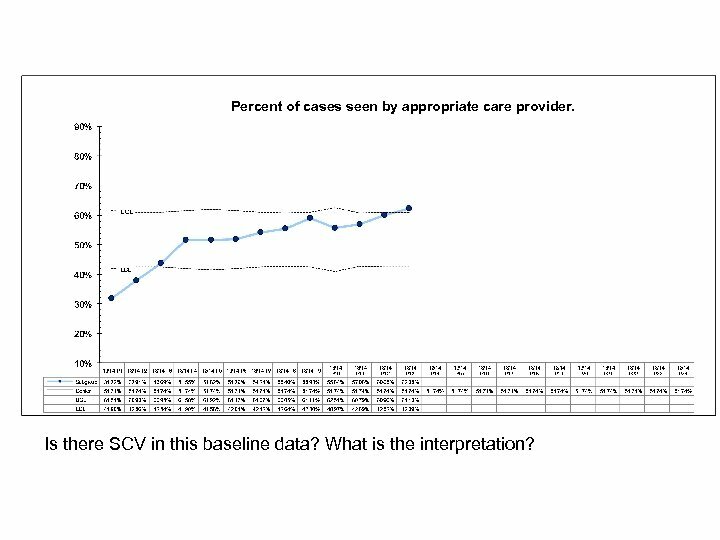 Percent of cases seen by appropriate care provider. Might be evidence of improvement in P 13. 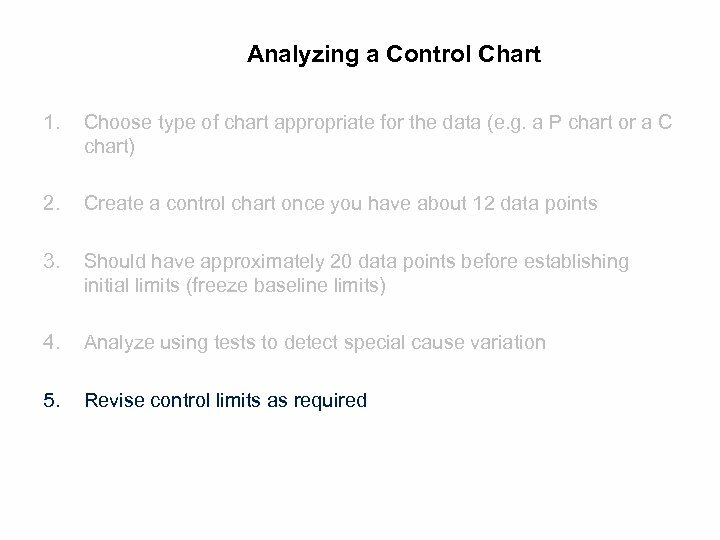 Revise limits after 20 data points and then interpret. 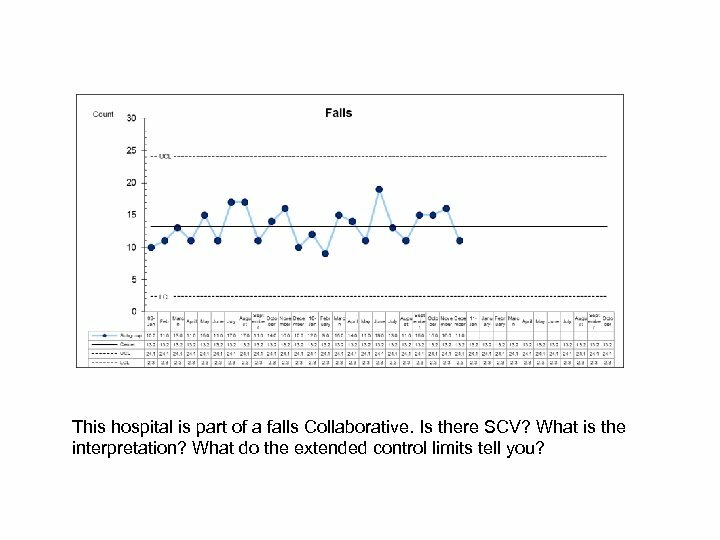 This hospital is part of a falls Collaborative. Is there SCV? What is the interpretation? 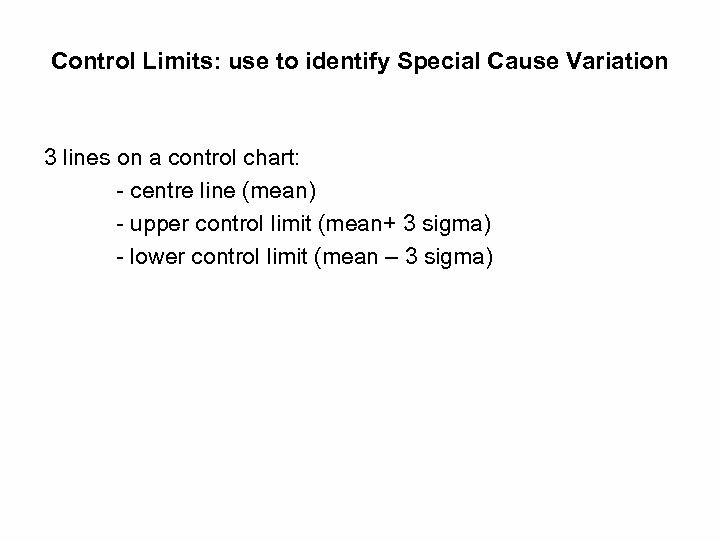 What do the extended control limits tell you? Stable system. 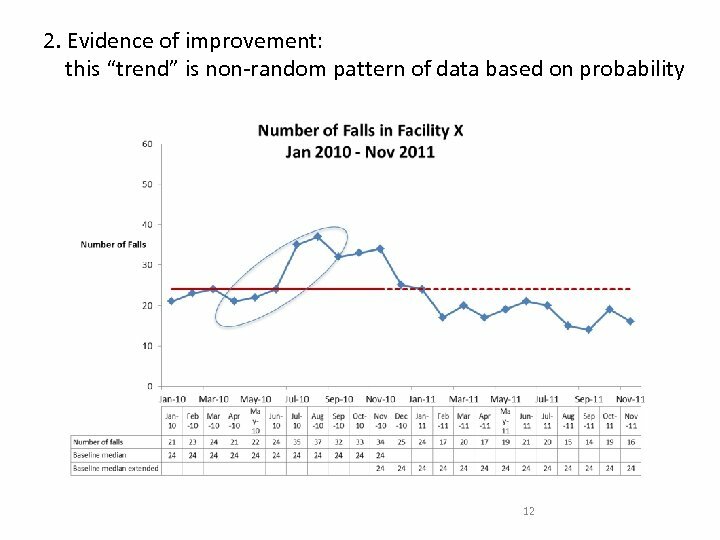 No evidence of improvement (or no evidence it is getting worse). 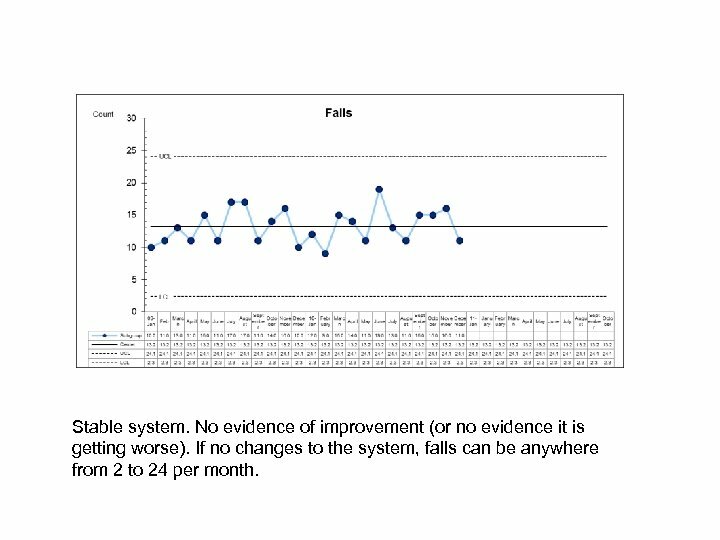 If no changes to the system, falls can be anywhere from 2 to 24 per month. 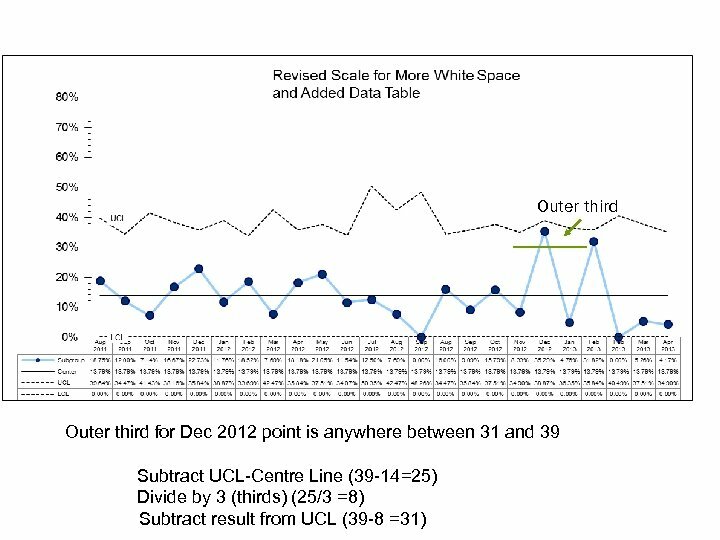 Number of teams with patient reps 30 UCL 25 20 15 10 5 0 Subgroup Center UCL LCL 09 -Jan Feb March April May June July August 18. 0 15. 9 27. 9 3. 9 24. 0 15. 9 27. 9 3. 9 20. 0 15. 9 27. 9 3. 9 14. 0 15. 9 27. 9 3. 9 10. 0 15. 9 27. 9 3. 9 8. 0 15. 9 27. 9 3. 9 14. 0 15. 9 27. 9 3. 9 18. 0 15. 9 27. 9 3. 9 Septem Novemb Decemb October 10 -Jan February March ber er er 19. 0 15. 0 13. 0 18. 0 15. 9 15. 9 27. 9 3. 9 April May June July August 15. 9 27. 9 3. 9 Septem Novemb Decemb October er er 15. 9 27. 9 3. 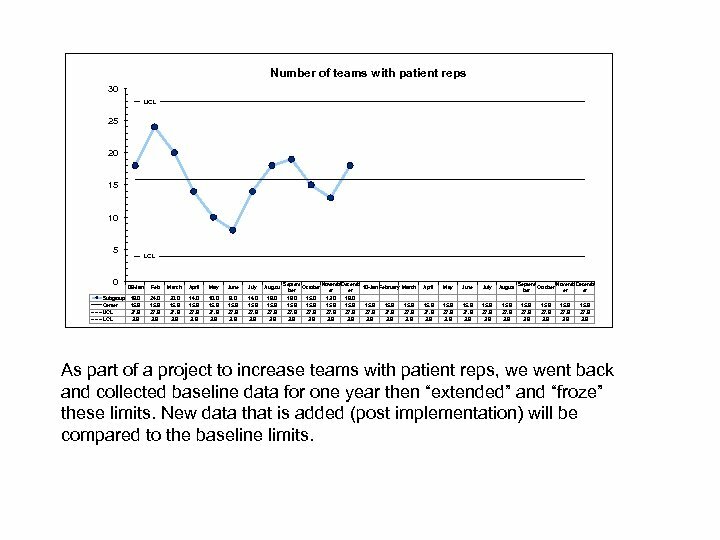 9 As part of a project to increase teams with patient reps, we went back and collected baseline data for one year then “extended” and “froze” these limits. 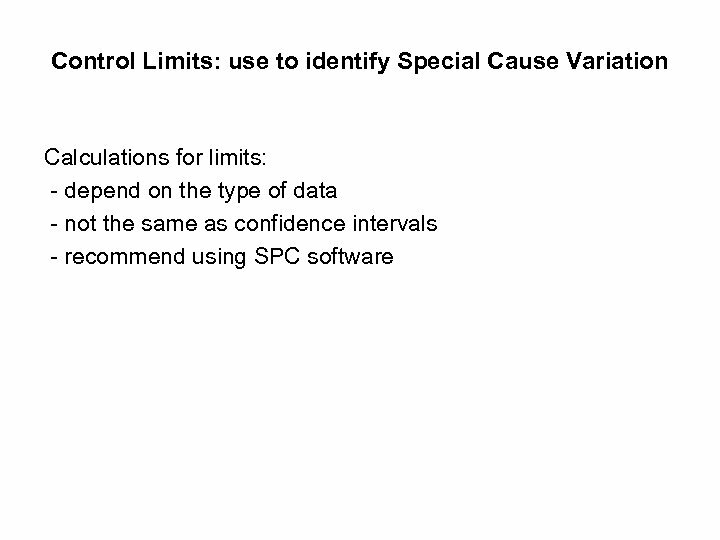 New data that is added (post implementation) will be compared to the baseline limits. 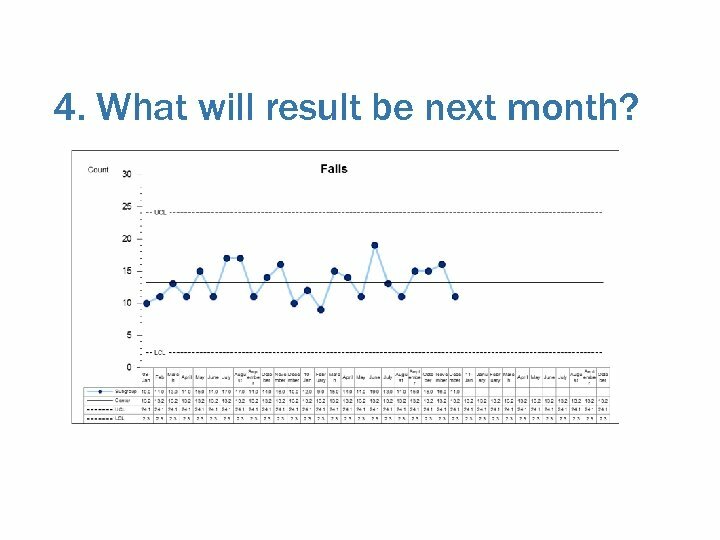 Number of teams with patient reps 50 45 UCL 40 35 30 25 20 15 LCL 10 5 0 Subgroup Center UCL LCL 09 -Jan Feb March April May June July August 18. 0 25. 8 41. 1 10. 6 24. 0 25. 8 41. 1 10. 6 20. 0 25. 8 41. 1 10. 6 14. 0 25. 8 41. 1 10. 6 10. 0 25. 8 41. 1 10. 6 8. 0 25. 8 41. 1 10. 6 14. 0 25. 8 41. 1 10. 6 18. 0 25. 8 41. 1 10. 6 Septem Novemb Decemb October 10 -Jan February March ber er er 19. 0 15. 0 13. 0 18. 0 24. 0 28. 0 45. 0 25. 8 25. 8 41. 1 41. 1 10. 6 10. 6 April May June July August 41. 0 25. 8 41. 1 10. 6 32. 0 25. 8 41. 1 10. 6 44. 0 25. 8 41. 1 10. 6 41. 0 25. 8 41. 1 10. 6 Septem Novemb Decemb October er er 29. 0 34. 0 36. 0 34. 0 25. 8 41. 1 10. 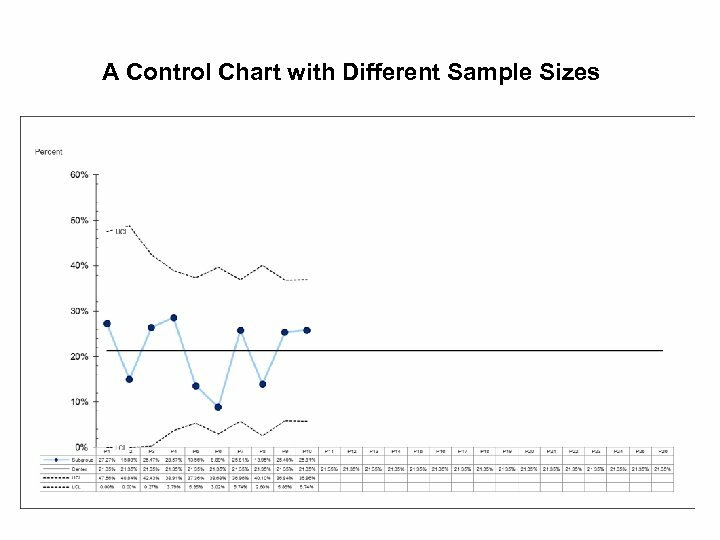 6 The new data is now being compared to the old data. 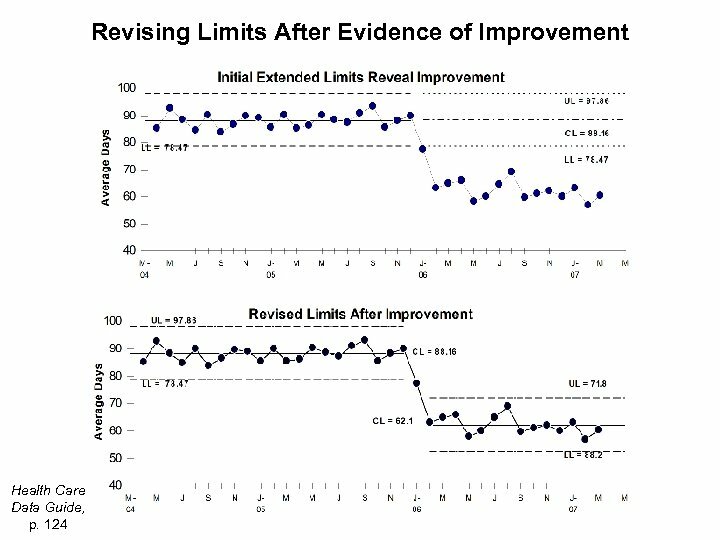 Note how the limits did not change with this new data (because we froze them). 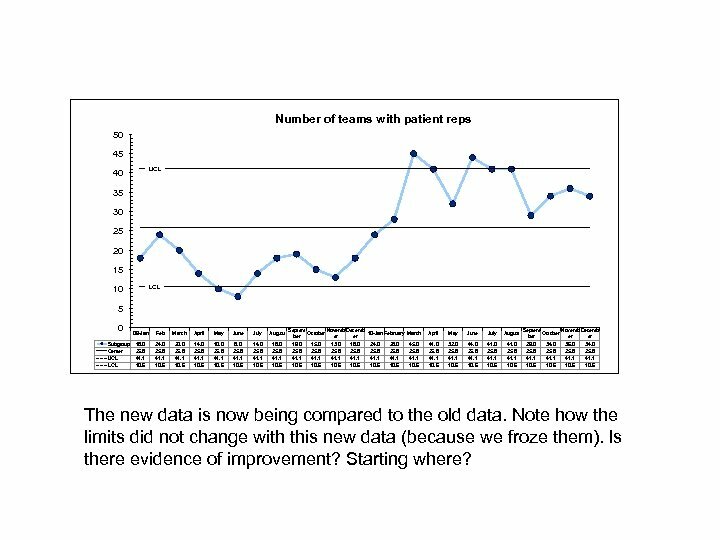 Is there evidence of improvement? Starting where? Number of teams with patient reps 60 50 40 30 UCL 20 10 LCL 0 Subgroup Center UCL LCL 09 -Jan Feb March April May June July August 18. 0 16. 5 28. 7 4. 3 24. 0 16. 5 28. 7 4. 3 20. 0 16. 5 28. 7 4. 3 14. 0 16. 5 28. 7 4. 3 10. 0 16. 5 28. 7 4. 3 8. 0 16. 5 28. 7 4. 3 14. 0 16. 5 28. 7 4. 3 18. 0 16. 5 28. 7 4. 3 Septem Novemb Decemb October 10 -Jan February March ber er er 19. 0 15. 0 13. 0 18. 0 24. 0 28. 0 45. 0 16. 5 36. 8 28. 7 55. 0 4. 3 4. 3 18. 6 April May June July August 41. 0 36. 8 55. 0 18. 6 32. 0 36. 8 55. 0 18. 6 44. 0 36. 8 55. 0 18. 6 41. 0 36. 8 55. 0 18. 6 Septem Novemb Decemb October er er 29. 0 34. 0 36. 8 55. 0 18. 6 New system. 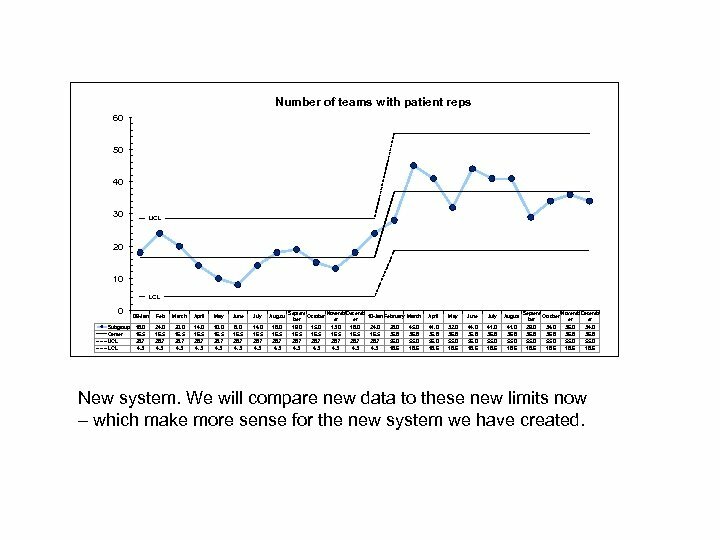 We will compare new data to these new limits now – which make more sense for the new system we have created. 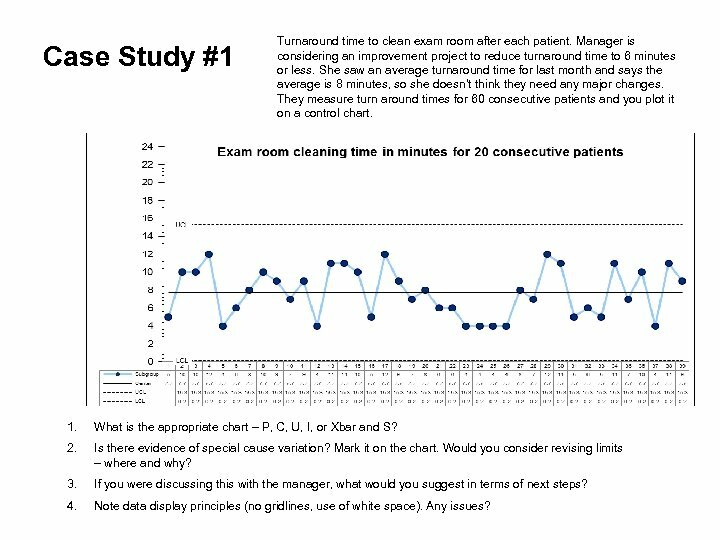 Case Study #1 Turnaround time to clean exam room after each patient. Manager is considering an improvement project to reduce turnaround time to 6 minutes or less. 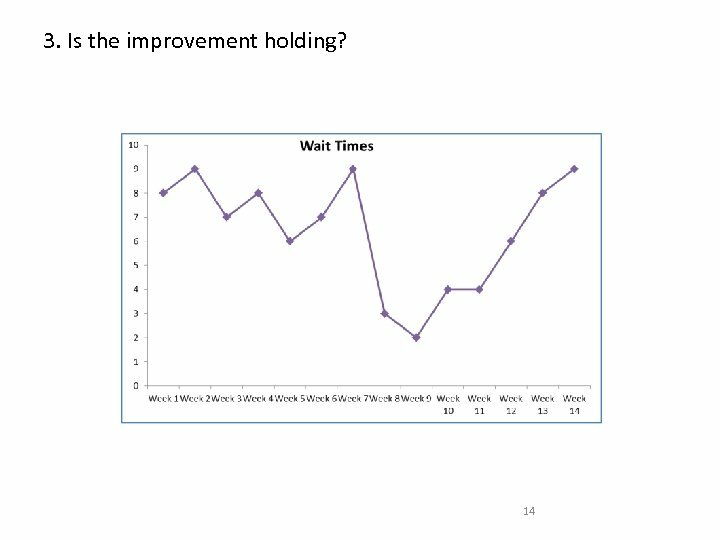 She saw an average turnaround time for last month and says the average is 8 minutes, so she doesn’t think they need any major changes. 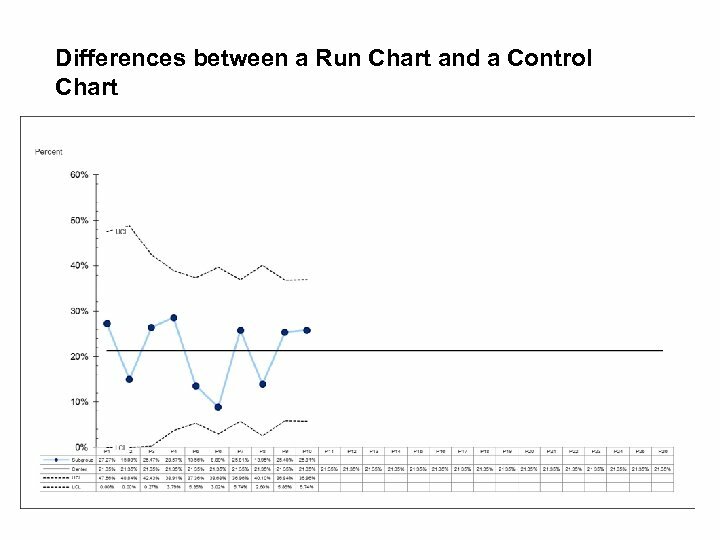 They measure turn around times for 60 consecutive patients and you plot it on a control chart. 1. 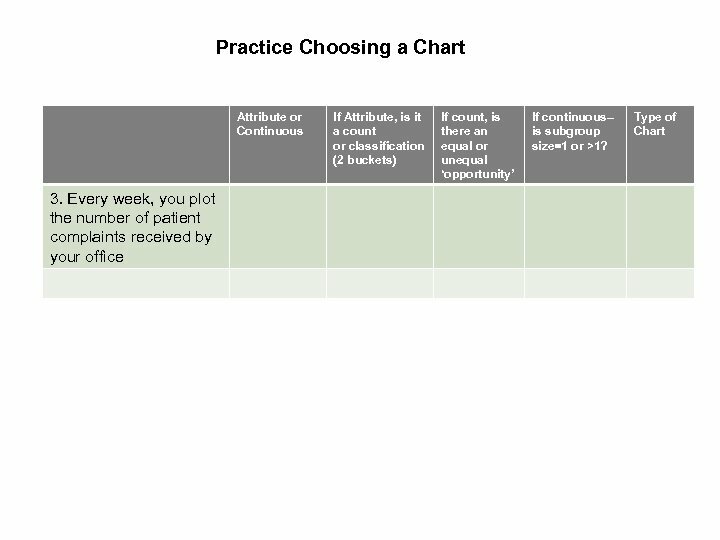 What is the appropriate chart – P, C, U, I, or Xbar and S? 2. 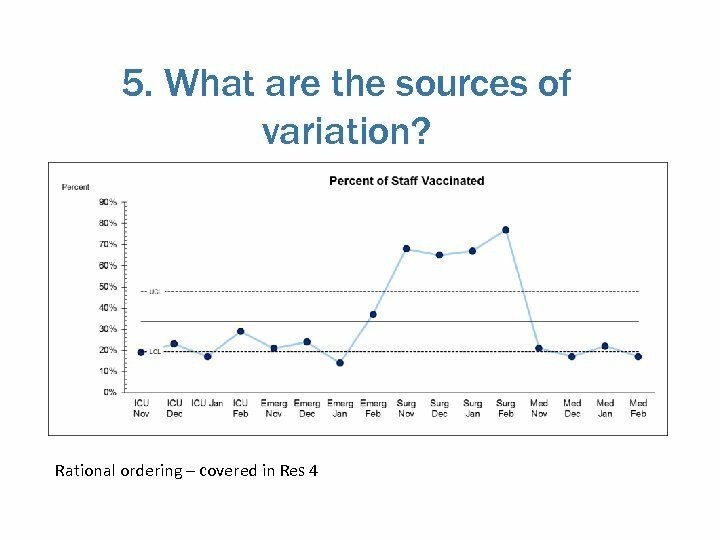 Is there evidence of special cause variation? 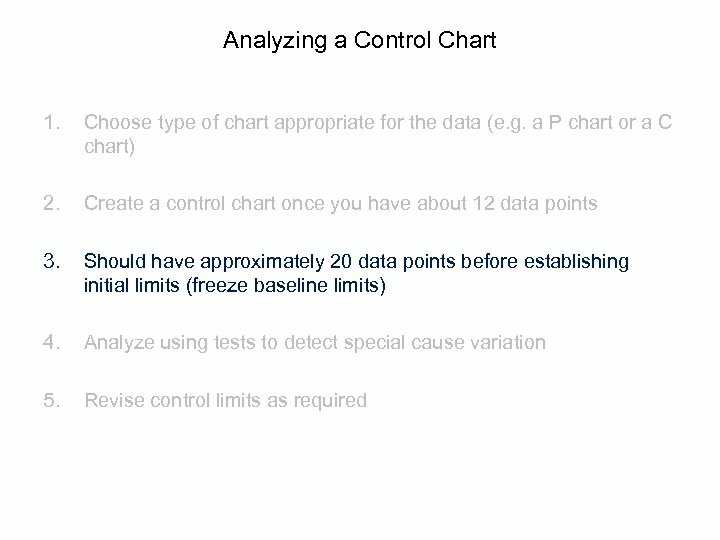 Mark it on the chart. 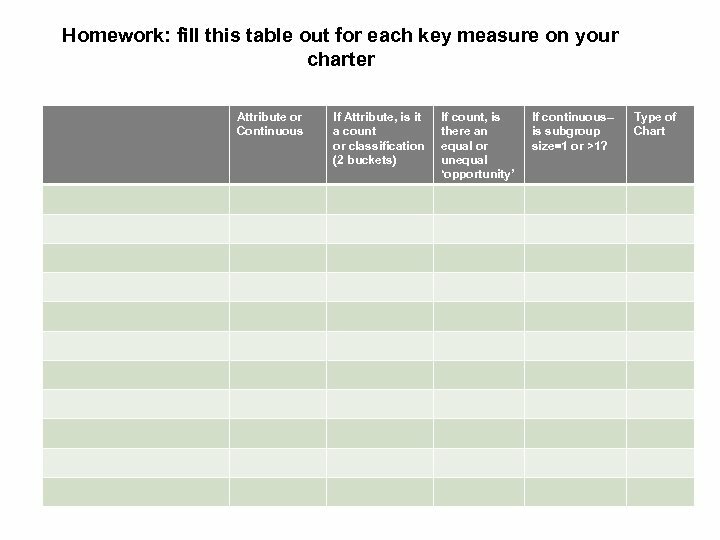 Would you consider revising limits – where and why? 3. 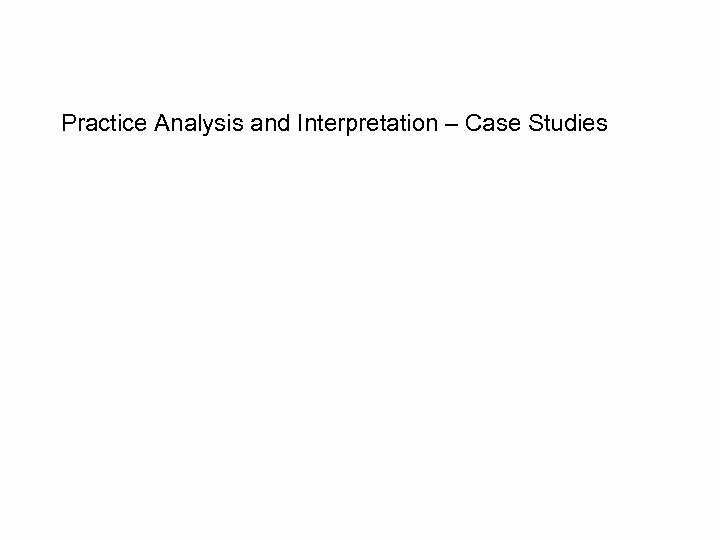 If you were discussing this with the manager, what would you suggest in terms of next steps? 4. 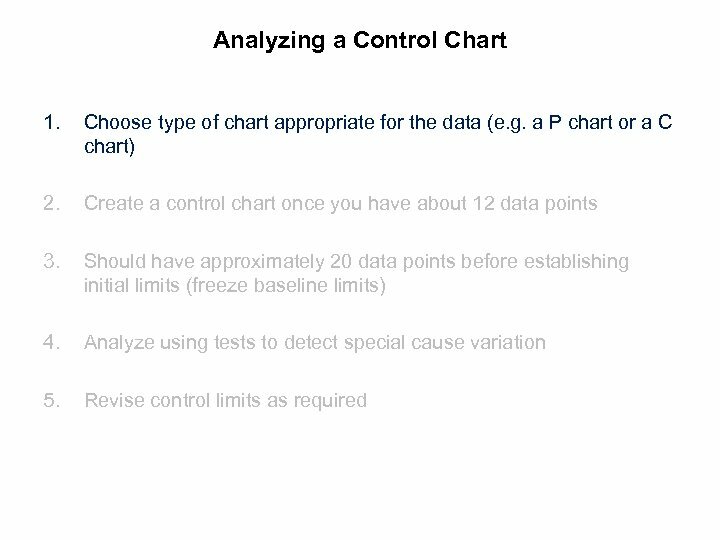 Note data display principles (no gridlines, use of white space). Any issues? 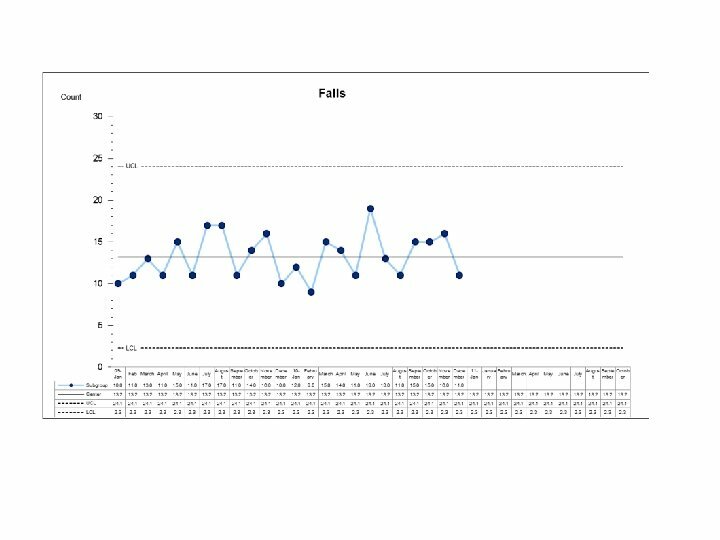 Case Study #2 This is the number of falls (indoors) reported in PSLS in residential care facilities (province wide). 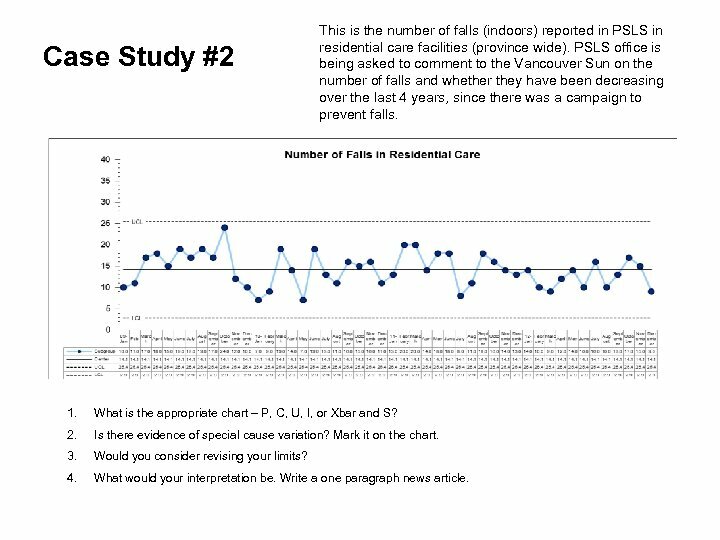 PSLS office is being asked to comment to the Vancouver Sun on the number of falls and whether they have been decreasing over the last 4 years, since there was a campaign to prevent falls. 1. 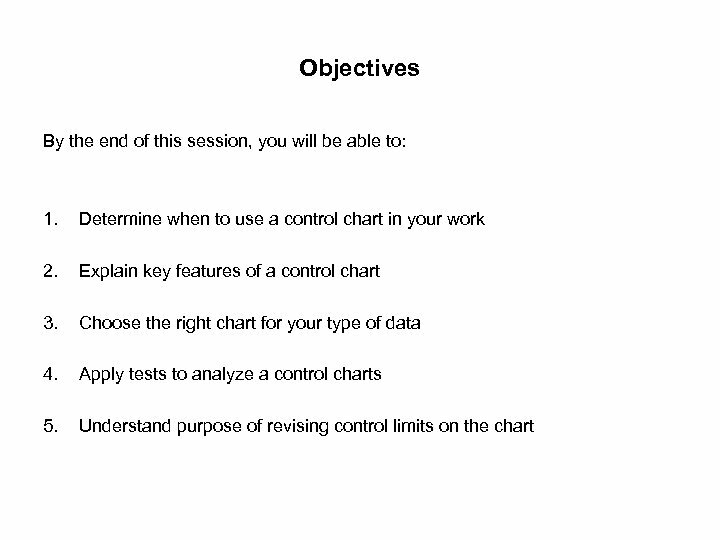 What is the appropriate chart – P, C, U, I, or Xbar and S? 2. 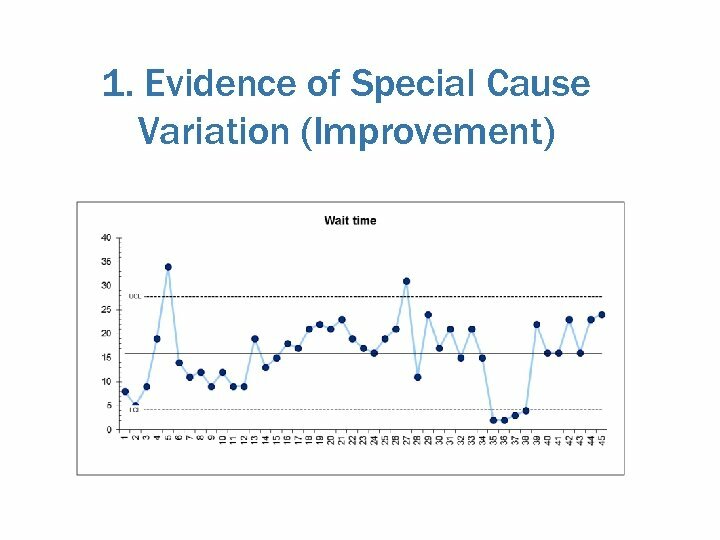 Is there evidence of special cause variation? 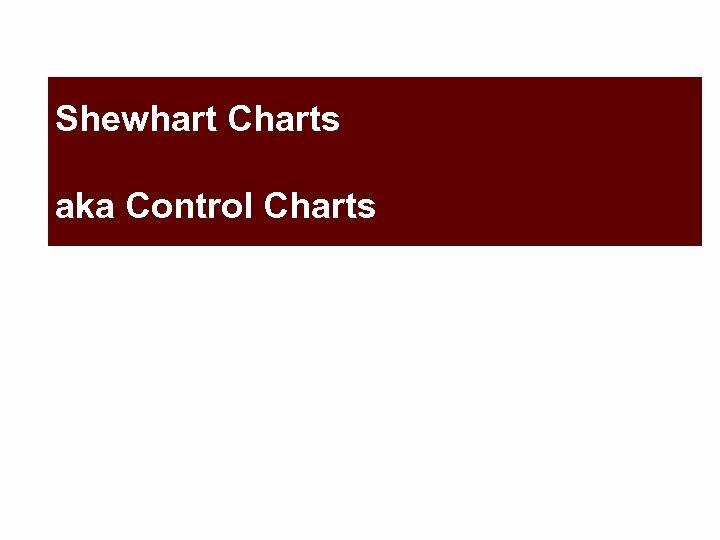 Mark it on the chart. 3. Would you consider revising your limits? 4. What would your interpretation be. Write a one paragraph news article. 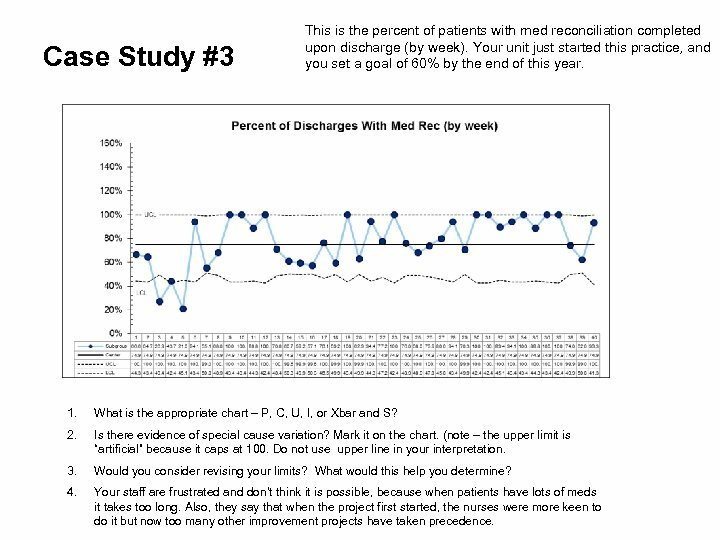 Case Study #3 This is the percent of patients with med reconciliation completed upon discharge (by week). Your unit just started this practice, and you set a goal of 60% by the end of this year. 1. 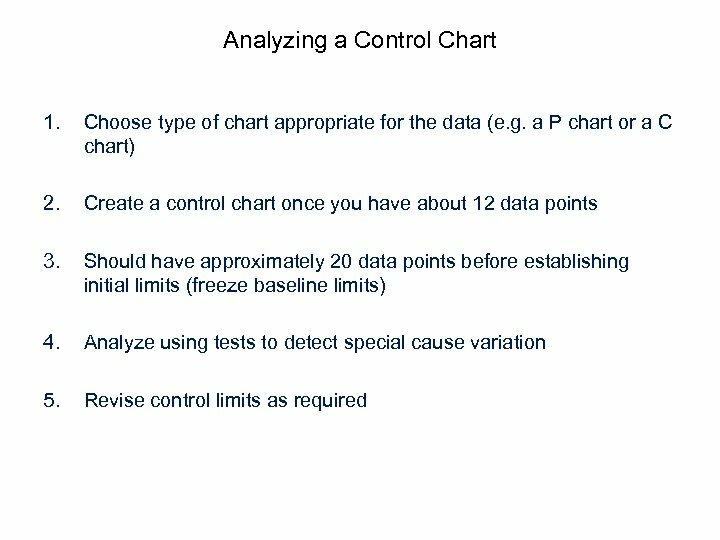 What is the appropriate chart – P, C, U, I, or Xbar and S? 2. 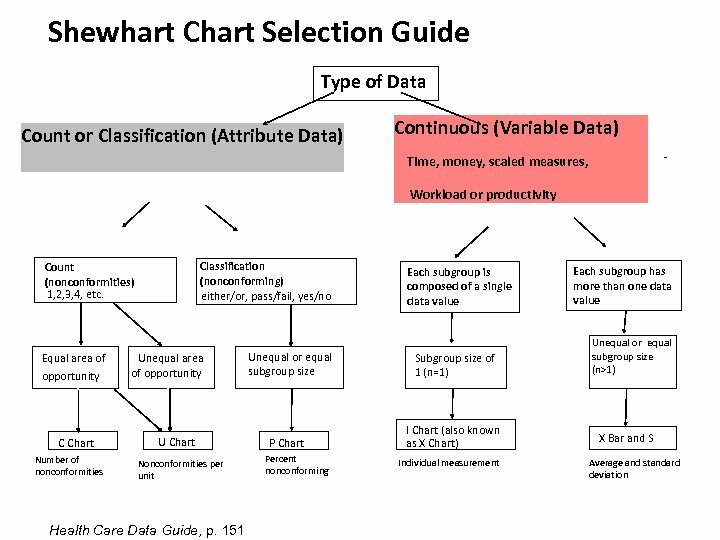 Is there evidence of special cause variation? 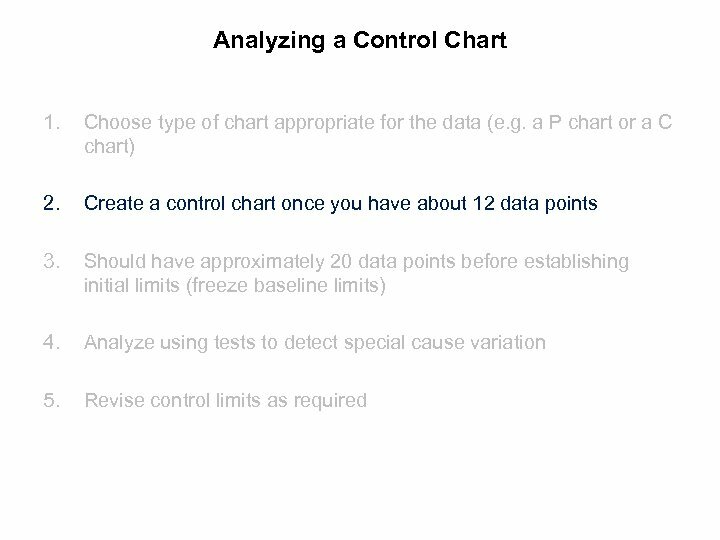 Mark it on the chart. (note – the upper limit is “artificial” because it caps at 100. Do not use upper line in your interpretation. 3. Would you consider revising your limits? What would this help you determine? 4. Your staff are frustrated and don’t think it is possible, because when patients have lots of meds it takes too long. 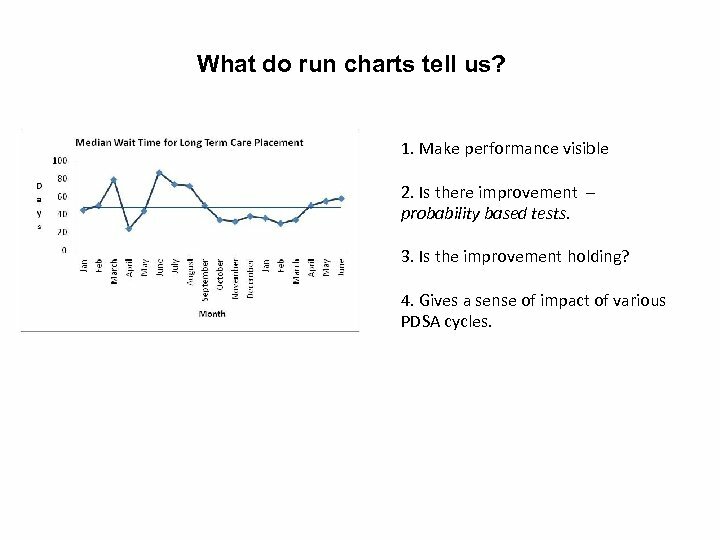 Also, they say that when the project first started, the nurses were more keen to do it but now too many other improvement projects have taken precedence. 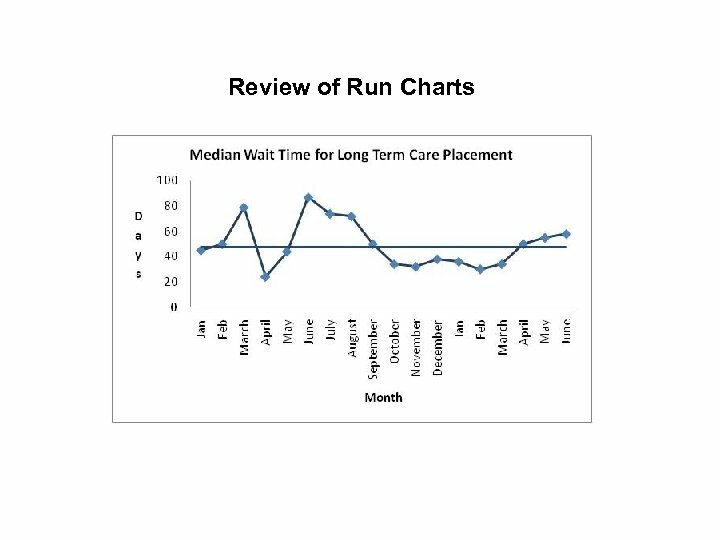 Case Study #4 This is the average wait time for first time patients to see a occupational therapist in your clinic. 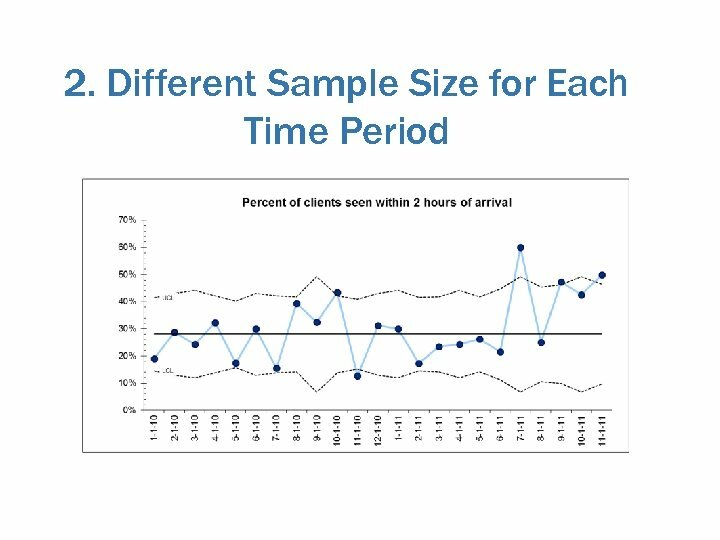 Your clinic started a system of pooled referrals in order to decrease wait times to under 21 days. 1. 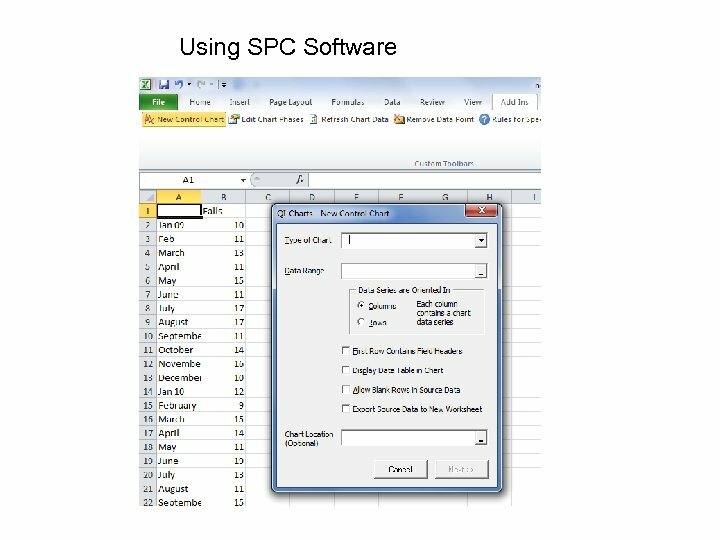 This is an Xbar and S chart. Can you describe what each chart is displaying? 2. 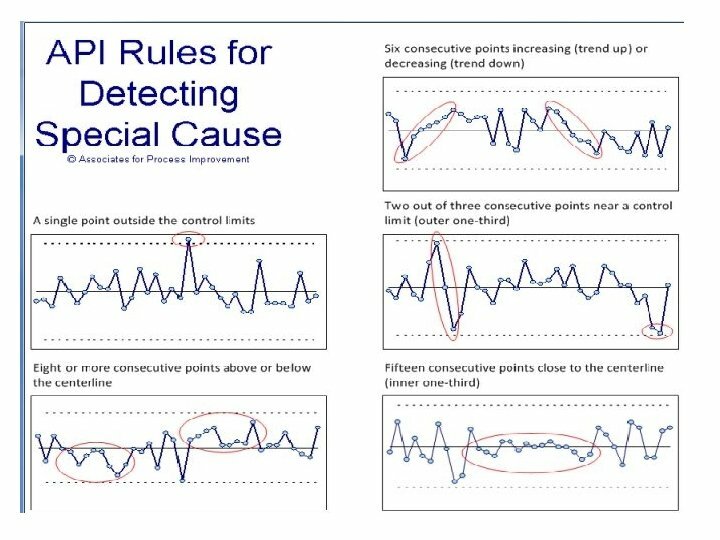 Is there evidence of special cause variation? 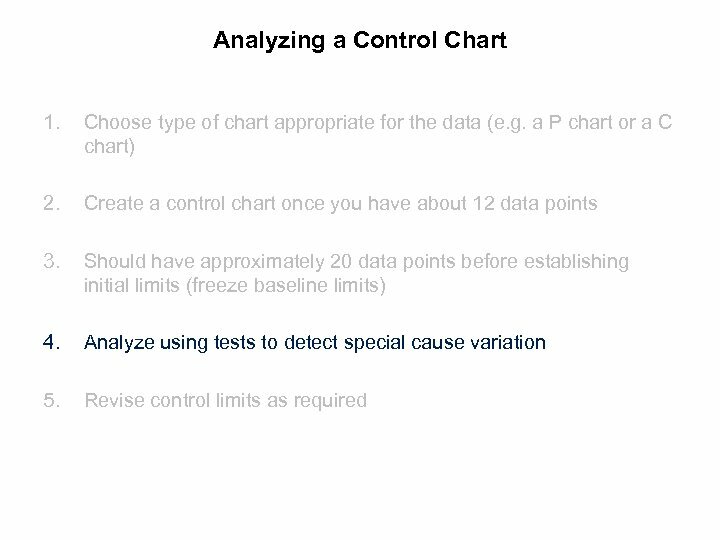 Mark it on the chart. 3. Do you think the project has worked? 4. Would you consider revising your limits? What would this help you determine?